One of the best things about moving around a lot is meeting lots of new friends! Living on a military base is a bit like being in college again, especially when, like me, you work there, too! There’s really no reason to leave “campus”. Home is here, work is here, the gym is here, the grocery store is here, and all your friends live within a few hundred yards walk. This is definitely a good thing, when you’re stuck in the middle of Enid, Oklahoma. 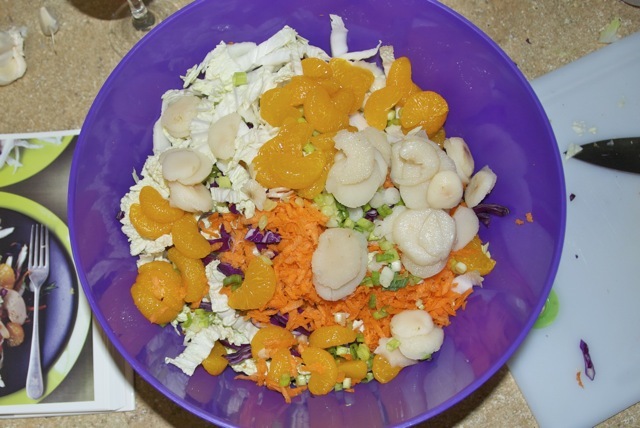 Last week, the girls had a potluck dinner and recipe swap. Of course this was right up my alley! 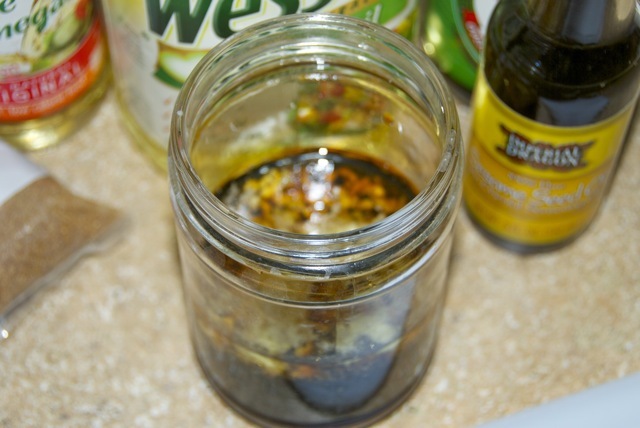 We had to bring a summer recipe to share. After crossing appetizers and desserts off my list (I knew there would be a lot of them), I set out to find a main dish that was summery, could travel well (down the street), and that didn’t have to be served at any specific temperature. I usually take my searches to the internet, but this time I didn’t have anything specific in mind, so I decided to flip through some of the cookbooks on my bookshelf. I found the winner in one of the first cookbooks I ever owned: Ellie Kreiger’s The Food You Crave. 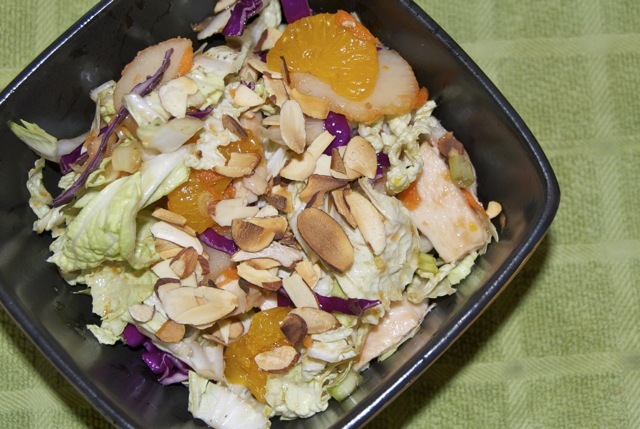 Ellie’s Chinese Chicken Salad sounded perfect. Summery, transportable… and you can’t really go wrong with chicken for a crowd. Preheat the oven to 350 degrees. 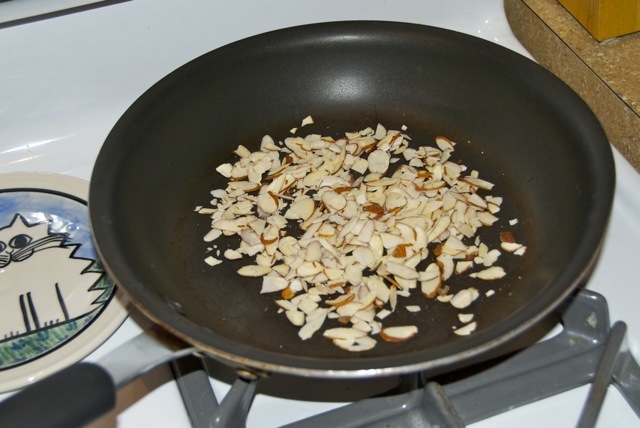 Toast the almonds in a small, dry skillet over medium-high heat, 2 to 3 minutes, stirring frequently until lightly browned. Set aside. 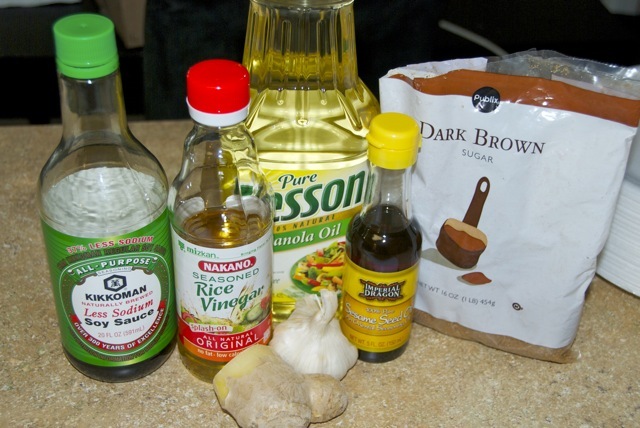 To make the chicken, combine the soy sauce and sesame oil in a small bowl and brush over chicken on both sides. 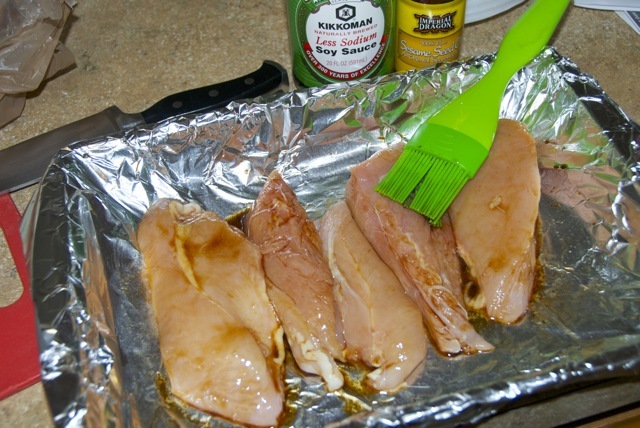 Arrange in a baking dish and bake until cooked through, about 13 to 15 minutes. Remove from the oven, let cool completely, and cut across into ¼-inch thick slices. 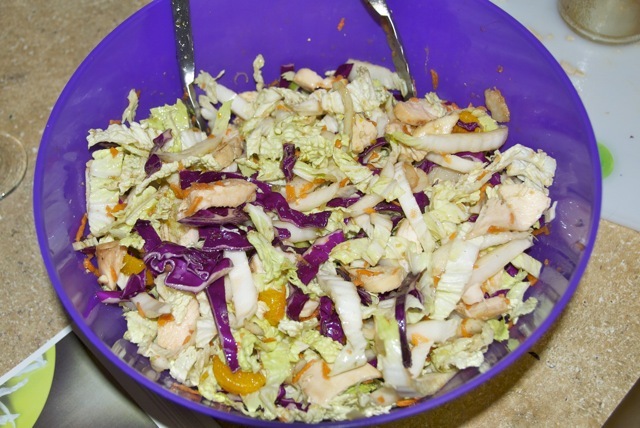 In a large bowl, combine the salad ingredients and chicken. Or use a jar and shake shake shake it, like I did! Pour it over the salad and toss to combine. 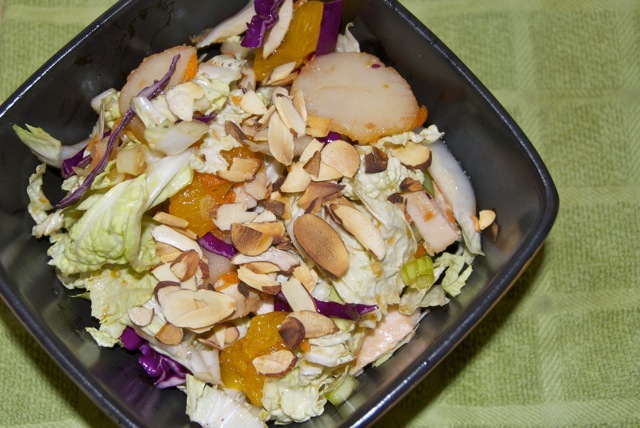 Top with almonds to serve. With all the food we had, everyone ended up taking home leftovers. Nick benefited from this and got some salad for dinner. He really liked it too, so I’ll definitely be making this one for us again!